"Worksheets Are the Worst" - Dave Stuart Jr. There should be zero worksheets allowed in schools. Only bad teachers use worksheets. In one sense, I get it. When a class period becomes nothing more than a teacher distributing worksheet after worksheet to keep kids busy, that class is probably falling well short of its potential. Our job is to teach, not to chuck worksheets at kids. But — but! — there are instances where things that look an awful lot like worksheets are simply the best and most efficient means through which to achieve a certain instructional goal. I have three examples, and what I hope to demonstrate with them is that it's not worksheets that are the worst — it's poor thinking about teaching and learning. A worksheet, after all, is an inanimate object. First, consider Mechanics Instruction that Sticks, a warm-ups curriculum (now with formative assessments) that my colleague Doug Stark creates during his summers. If you simply take Doug's pack of warm-ups and chuck them at your students, letting them work alone while you scroll through Facebook, then yes, that's really poor teaching. But if you read Doug's instructions on “How to Use the Warm-Ups,” it doesn't take long to move away from that kind of thing. The warm-ups will not work if you use them like worksheets. You can’t just hand them out and let the kids go. I try to think of each warm-up as an interactive lesson with multiple checks for understanding. It's this thoughtfulness around the warm-ups that transforms them from what we often mean when we say “worksheets” and into an integral, efficient part of an impactful writing classroom. 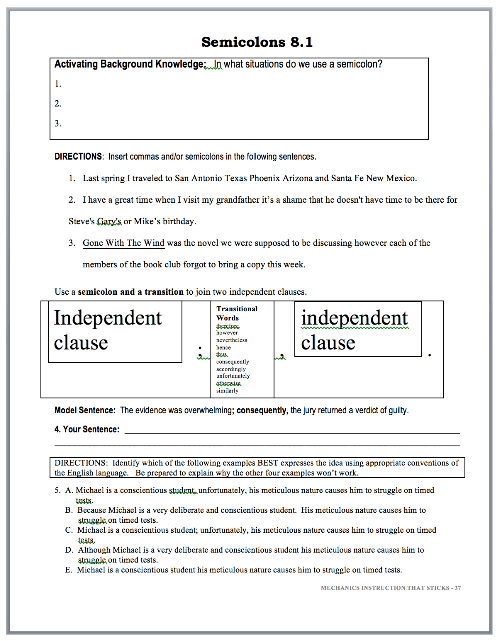 Doug has simply taken his hard-earned awareness of the knowledge and skills students need for conventional writing, and he's boiled it all down into the most efficient tool he can devise. Yet if you walked into Doug's room during one of his warm-up mini-lessons and had a hardened bias against all things that look like worksheets, you could easily miss the masterwork happening at that moment and instead (foolishly) disdain it. 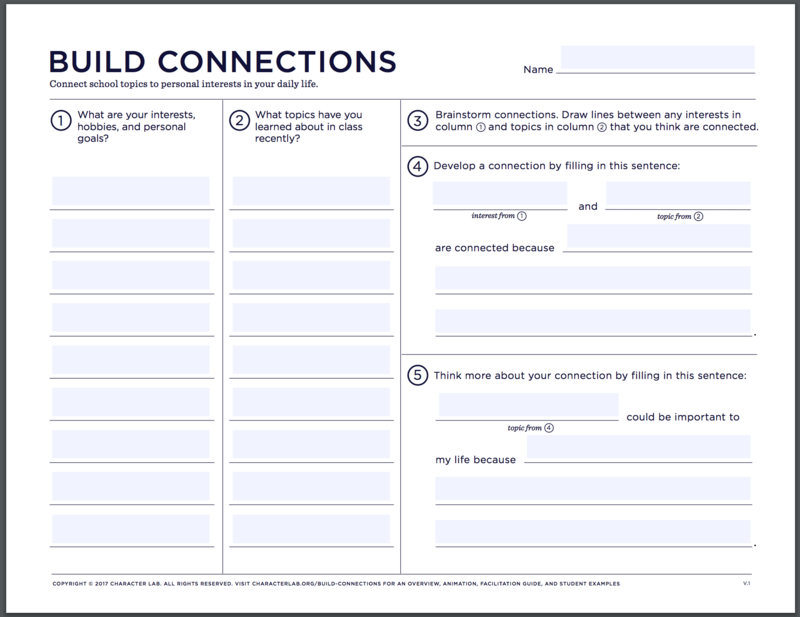 Next, consider the Build Connections exercise that Chris Hulleman and Character Lab have put together. On its face, it's a single-sided worksheet with lots of neat lines for kids to write on. You could, once again, take this thing, chuck it at your students, and head to your favorite news site while they scratch their heads and try to puzzle through it. But in the hands of an earnest teacher who takes the time to read the science and strategies behind this worksheet (I've written a bit here, Character Lab has a whole page here, and we discuss the tool in-depth inside the Student Motivation Course), this can become a recurring tool for creating pair, small group, and whole class discussions around how Algebra or Physics or Hamlet or the Han Dynasty relates to students' actual lives. In short, it's a tool for helping kids become better, more motivated thinkers and learners. It's awesome. Finally, let's look at WOOP — thought-child of the brilliant Gabriele Oettingen. 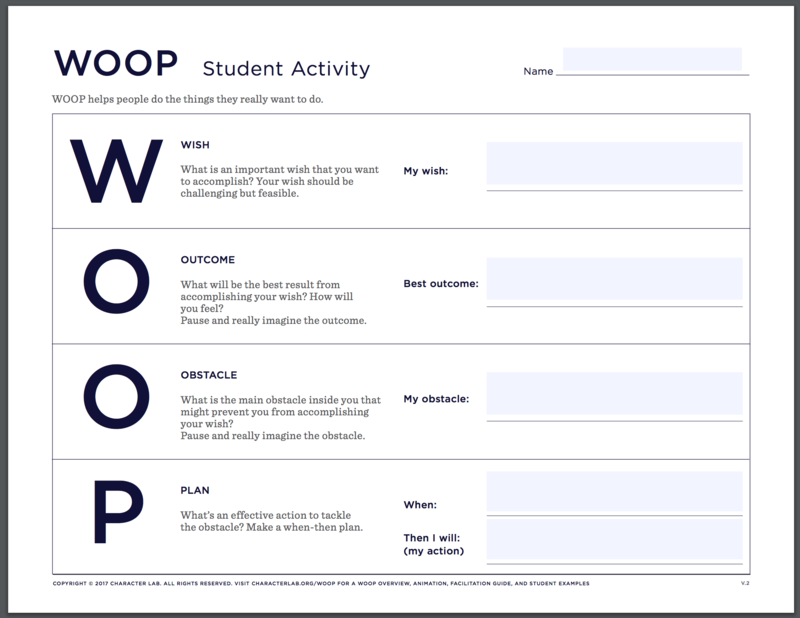 At a conference in Philly this past summer, Gabriele Oettingen led participants through the WOOP goal-setting protocol, using this worksheet as a tool for the process. There were practically tears by the end from multiple participants because it was so beautifully done. Like the other two examples in this post, the WOOP sheet is designed to expedite the WOOP process. In the hands of a teacher who invests the time into studying and using WOOP, both in her own life and in her classroom, this is the furthest thing from a mindless, time-wasting, or “busy work” kind of activity. My point is broader than the relative utility of a given sheet of paper in a teacher's classroom. It's that I think we're wise to avoid sweeping statements like “worksheets are the worst,” “all books are good books,” “desks in rows are evil,” and so on. These kinds of things don't make us better thinkers. They make us worse. So let's have less of that. Than you again Dave for reminding us that we need NOT throw the “baby our with the bath water.” The world of education is becoming an “all or nothing” world and for many great, experienced teachers it becomes overwhelming. I believe “The Gist” in this blog post is powerful…I hope others heed the word. Keep doing what you do…its important work! Thank you for this thoughtful take on worksheets and when they fit instructional and student needs! Much thanks to Doug for his work on Level D in MITS. This level helps further address a recent online Q&A discussion with Dave about helping older students revise bad style. The MITS resource is excellent for collaborating more effectively about mechanics up the grade levels and across the disciplines here in our high school setting.